When I was a child, I wanted nothing more than to have a dog. I had seen all those television shows and read all those books, showing children and their faithful companions. The one creature who could always be counted upon in times of sorrow, or crisis, or need of any kind; or just to love and be loved. Standing in the way of this was the fact that my mother really didn’t want a dog. She didn’t want to be left taking care of it and she didn’t want to fall in love with it. But I was a resourceful child. I begged and wheedled, and finally came up with “The Plan.” I promised to keep my half of the bedroom I shared with my sister clean and neat for three months. My mother, secure in the fact that I lived with a complete and total slob, agreed. She lost. Once the main part of the deal was won, I still had to convince her to let me get the kind of dog I wanted. Here, the ground rules were simple, my mother would get to pick the breed. I was willing. A dog was a dog. At the age of nine we brought home our first puppy. She was a six-month old Yorkie named “Jane of the Vale”. Unfortunately for me, Janie was clearly my mother’s dog. She adored Mom and Mom adored her. They even shared a morning cup of coffee. Try as I might, I could never get Janie to bond with me. Several years later I was able to convince my parents to try again. We decided to get a second dog. This time, we all fell in love with an adorable Maltese that I dubbed “Avis”, because she was number two and tried harder. Avis was indeed my dog. She loved me and I loved her, but somehow it still wasn’t the relationship I had always hoped to have. Years went by, my two childhood friends went to the Bridge, I grew up and moved across the country. I met the love of my life and married. Still, in spite of a shared passion for all things canine, we remained dogless. Then, one day I went out to the parking lot of our apartment by the beach. Cowering in the corner of the garage was this small caramel-colored creature. He was hungry and terrified. I ran back to the apartment and convinced my love to come out and see the poor quailing creature. At first he refused. He knew that if he came to look his heart would melt. Finally, with some slices of ham in hand, he came with me. Poor little dog, he wanted that ham, but he was so afraid. Finally, he ate it, growling as fiercely as he could the whole time. With the help of a neighbor we managed to capture him. As soon as he was in my arms, he melted against me in total surrender. We decided to call him Taffy, just so that we had a name to use until someone claimed him. Taffy lived with us for eighteen years. He was wonderful dog. We thought he was a mutt until we found his picture in a dog book, listed under Basset Fauve de Bretagne. The personality description was perfect: stubborn and independent. That was Taffy in a nutshell. I like to say that Taffy allowed us to live in his house as long as we did as we were told. He wasn’t particularly affectionate, except when he felt like it, but he was a special character. There isn’t enough room to write about all the funny quirks that made up our Taffy Jerome. Thinking about him will always make me smile. Still, as much as I loved him, and that was more than I could possibly describe, it wasn’t the relationship of which I had always dreamed. But the silence in the house was deafening. My love and I both work at home and the lack of a doggish presence was too much to bear. Finally, we admitted it, our friends had been right. We needed to have a dog in our lives. Saturday morning rolled around. We were going to start looking, go to a couple of rescue fairs and see what dogs were available. I looked in the paper under adoptions to find some places to visit. As I scanned the column there it was, “Orphaned. 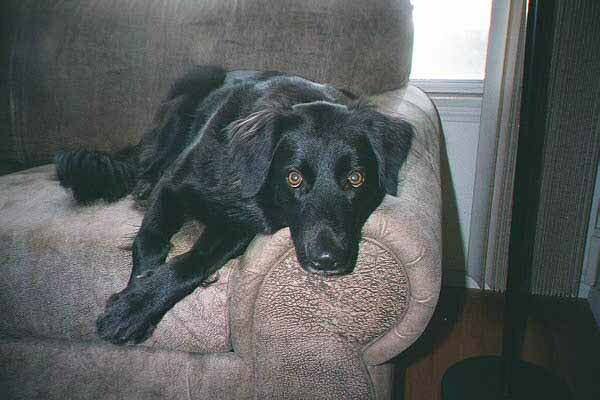 Maggie, 1 year-old Border Collie/Black Lab X.” Somewhere deep inside I knew that we were meant for each other. She had lost her family, we had lost our baby. We needed each other. That afternoon my love and I went to the pet fair. All the dogs were pulling at their leads, jumping, barking like mad. At the end of the group was a beautiful, quiet, gentle creature. We went over to meet Maggie. I sat down in a chair and immediately she came to sit between my feet; as time passed she pushed closer and closer to me. Then, my love sat on the sidewalk and she went to sit in his lap. We were smitten. We agreed to a trial period to see if Maggie wanted to love us as much as we wanted to love her. The time between Saturday and Tuesday crawled by at a snail’s pace. I went out and bought her everything I could think of that she might want. Then, she was here. That first night she was so afraid. I sat on the floor beside her for hours, stroking her head and belly. She slept on the floor next to my side of the bed all night. She got up a dozen times to put her head on the bed to reassure herself that I was still there. In the morning she chattered and sang with happiness when I awoke. I knew. I knew that morning that it had happened, finally… The relationship I had always sought. I had found the dog of my dreams, and I was happy.